Every time Spring rolls around I begin the transformation from Winter hibernation to Summer beach babe. Now usually this involves me grabbing my pot of St Ives Invigorating All Over Body Scrub (which I swear by), defuzzing my legs and then slathering on whichever moisturiser takes my fancy in the shops. 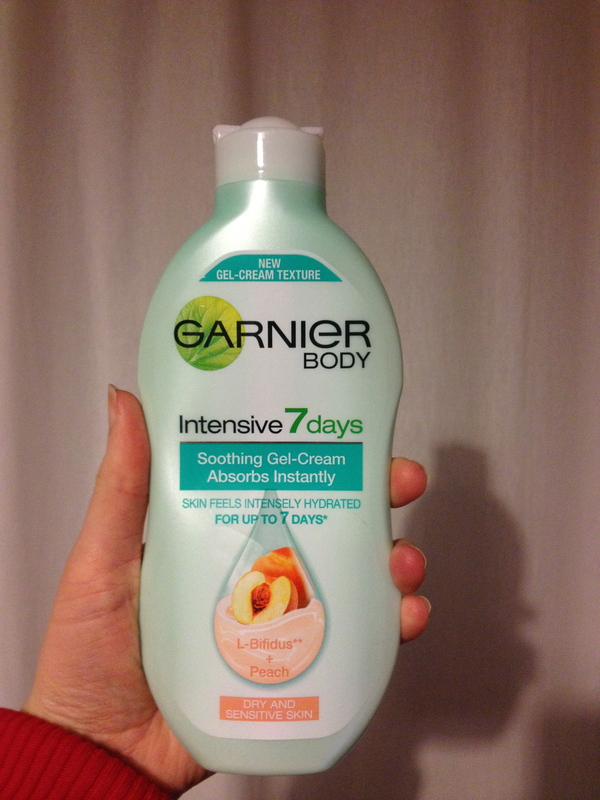 This year that moisturiser was Garnier’s Body Intensive 7 Days Refreshing Gel-Cream with Peach. To be honest, the first thing that drew me to this moisturiser was the idea of a gel/cream hybrid and the promise that it absorbs instantly. For those of you who don’t know me I absolutely hate to be sticky in any way, shape or form so the idea that my moisturiser might sink in instantly was too much to walk away from. Now I should say now I’m not usually one to write a post before I’ve fully made up my mind about a product. Usually I’d sooner sit on the fence until I have formed an opinion or even not write the post at all instead of writing a review that might not inform you guys of much. In this instance though I just couldn’t keep my first impressions to myself. Garnier promise that after 4 weeks of continuous use this product will leave your skin feeling intensely hydrated for up to 7 days after the last application. Obviously with this being a first impression I can’t comment on this fully just yet, although I can say in my first week of use my skin has felt much softer so it must be doing something. I’ll do a full review in a few weeks time when I’ve used this for the recommended 4 weeks. So far, so good right? Wrong! They also claim this product is a lightweight, non-greasy, non-sticky formula that absorbs instantly. How wrong could this be. When someone tells me their product will absorb instantly I’ll expect big things. When that same product still hasn’t sunk in after 10 minutes I’ll feel disappointed. And when both these things happen and I’m left feeling sticky I’ll be aiming this product at the nearest bin. It’s not all bad though, I can say for certain this product wasn’t at all greasy, so they got one thing right. I’ll continue using this as the results seem pretty good so far, but I definitely won’t be repurchasing once it’s empty. Life’s just too short to be left feeling sticky! If you fancy trying Garnier Body Intensive 7 Days Refreshing Gel-Cream with Peach for yourself you can get it for just £1.99 in Boots until May 15th.